There is absolutely no frying involved in this recipe…it is so easy….and so delicious. 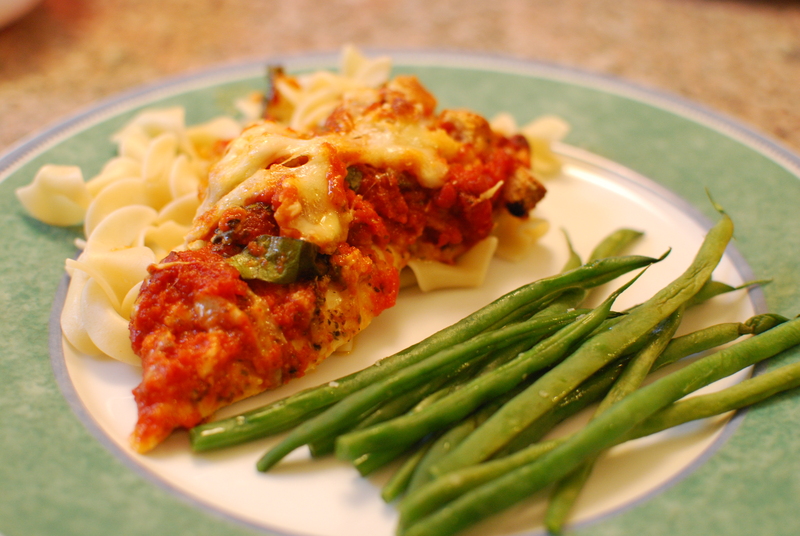 It’s definitely a healthier version of traditional chicken parmesan and no one misses the hassle or the extra calories of the traditional version. The croutons give this dish the breading of the traditional version, and since I use fat free croutons, none of the guilt. The kiddos devoured this meal! In a 9 x 13 pan, add olive oil and garlic; then add the chicken and sprinkle with salt and ½ tsp. of Italian seasoning. Crush ½ of the croutons and sprinkle over chicken; then cover chicken with 2/3 of the jar of sauce. Add remaining Italian seasoning and chopped basil. Then add 4 oz. of shredded mozzarella and 2 oz. of grated Parmesan; then spread remaining sauce over the cheese. Top with remaining croutons and remaining cheese. 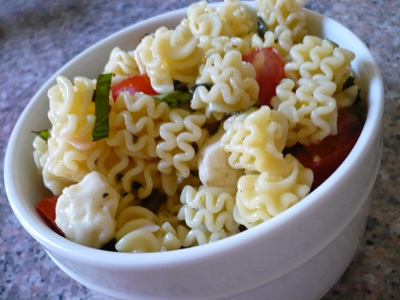 I love pasta salad, and I especially love pasta salad that has bold delicious flavors. 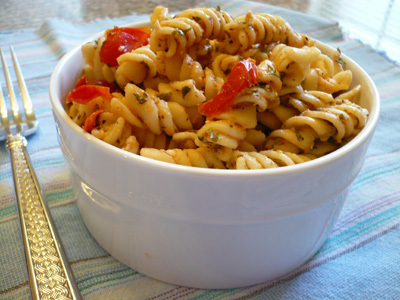 This pasta salad certainly has bold delicious flavors. I’m not sure why it’s a common sentiment that a little bit of dried herb goes a long way, but I think that’s the furthest from the truth. I think if you use just a little bit of the dried herbs, your food won’t have much flavor, and we’re all about flavor! Don’t be scared off by the amount of dried herbs…trust me, it’s delicious! A friend of mine made a similar pasta salad for an event we went to, and while she didn’t have a recipe, she told me what she put it, and this is my version. This is a great one to bring for a potluck or picnic too. 1 lb of grape tomatoes, halved. 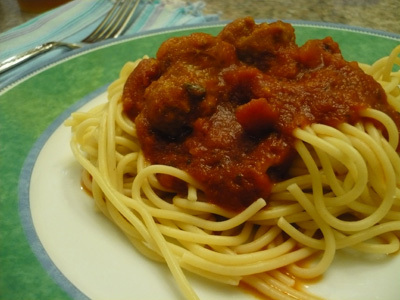 Bring a large pot of water to boil over high heat; then add salt and pasta, and cook until al dente; then drain. Meanwhile in a large bowl combine olive oil through feta and stir to combine. Mix so that some of the feta actually breaks down in the dressing (emulsifes) and the dressing becomes a bit “creamy;” then add the tomatoes; then add the pasta. Toss to combine and taste. Correct seasoning to taste. I saw this pasta salad in the September 2010 issue of Food Network Magazine, and I knew I had to try it. I’ve now made this quite a few times, and I’ve adapted the recipe to our liking. It is delicious, and I love the addition of the lemon zest. 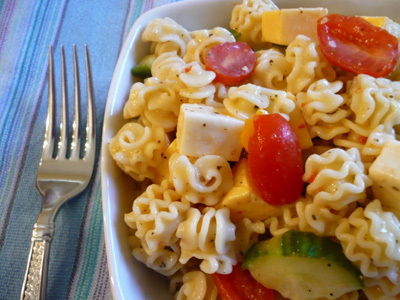 It’s a great summer pasta salad, which would be perfect for a picnic or potluck. We’ll definitely be making this one again. Whisk the olive oil, lemon juice, shallots and garlic in a large bowl. Season with salt and pepper. Add sugar. Add the tomatoes and gently toss. Marinate at room temperature, about 15 minutes. Meanwhile, bring a large pot of slated water to a boil. Add the pasta and cook as the label directs. Drain in a colander and run under cold water to stop the cooking. Add the pasta and mozzarella to the tomato mixture and toss. Stri in the basil, mint, and lemon zest, and season with salt and pepper. Refrigerate, tossing occasionally until serving. This sauce recipe is awesome! It tastes like something you would get in a restaurant. The original recipe calls for cooking the sauce for 4 minutes, but I like the flavors when the sauce is simmered for a longer period of time…it’s richer and bolder. But if time is short, you can certainly cook the sauce for a short time and it still will be delicious. I added zucchini to the sauce and it was delicious. It was a great way to get more veggies, and it gave the sauce great body and flavor. The other thing I like about this recipe is how the cook the sausage. It’s broiled, which is brilliant, because it’s a very low fat no fuss way to prepare sausage. Adapted from a recipe in the April 2010 issue of Cooking Light. Place zucchini in a food processor; process until roughly chopped. Add tomatoes to the zucchini and process until almost smooth. Heat olive oil over medium high heat. Add crushed red pepper and pressed garlic; saute for 1 minute. Stir in zucchini and tomato mixture, sugar, and salt; cook 4 minutes. If you can cook the sauce longer you won’t regret it. It gets thick and rich…I let mine simmer for 45 minutes to 1 hour. Meanwhile preheat broiler. Arrange sausage on a baking sheet. Spray with cooking spray. Broil sausage for 5 minutes on each side or until done. Remove and slice in 1/4 inch thick slices. 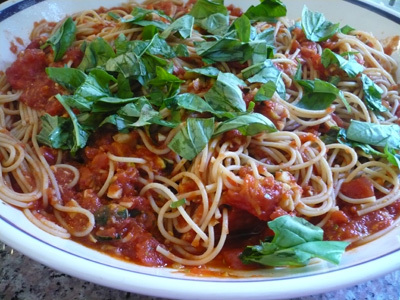 Place pasta in a large bowl; toss with sauce and sausage; add basil and peccorino. 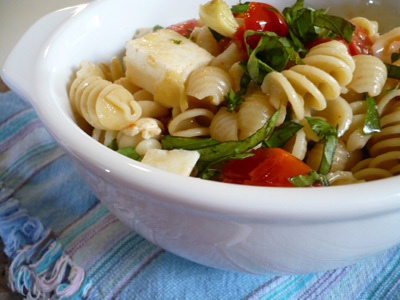 This is a very easy and very tasty pasta salad…even -s and TT ate it up. I think next time I’ll do without the cheddar and jack cheese and instead try feta for an extra punch. Adapted from a recipe by Rachel Griffith. You could also add olives, artichoke hearts, feta instead of the other cheeses etc. Meanwhile chop veggies and cheese and put in a large bowl; then add one bottle of salad dressing. Allow veggies and cheese to marinate. When pasta is done, drain it and rinse it with cold water, then dump a bunch of ice cubes on the pasta to stop the cooking process and help it cool quickly. Once pasta is completely cool, add to veggie mixture; toss to coat and refrigerate for at least a couple of hours. Before serving, toss pasta salad, and add more dressing, if desired. My mother-in-law started makes a delicious pasta salad during the summertime, and this is my version. It’s super tasty, and it works well as a main dish or a side dish. Put the tomatoes in a bowl and add some salt. Heat olive oil in a skillet; then add the garlic and cook for 3 minutes; then add the tomatoes and cook for another 5 minutes. Put pasta in a big bowl, add the tomatoes and garlic with the oil and toss to combine. Then add the cheese, basil, and artichoke hearts and toss again. I had a tube of polenta I wanted to use up, and I also wanted to try something new, since it seems like for the last couple of months I’ve been making mostly family favorites. I came across a recipe that sounded really good to me, so I gave it a whirl, and it was really good, and it also was really good as leftovers. Served with a tossed green salad and a fruit salad, this was a very satisfying and delicious meal. Adapted from Simply Recipes. Original recipe from Sunset Magazine. Heat 3 Tbsp of oil in a 2-3 qt saucepan on medium heat. Add tomatoes and Italian seasoning, simmer, uncovered for 30 minutes, or until thick. Meanwhile, in a large nonstick skillet, heat 1 Tbsp oil over medium-high heat. Add the onion, bell pepper, garlic, salt, pepper, and chili flakes. Cover the pan, lower the heat to medium, and cook until the vegetables have softened, about 5 minutes. Add the sausage, stirring and breaking it into small pieces as it cooks, about 5 minutes. Cover the pan and cook until vegetables are tender and the sausage is cooked through, about 5-8 more minutes. Add the tomato sauce and simmer for 10 minutes. While veggies and sausage are cooking, preheat broiler, and coat the bottom of a 9×13-inch baking pan with a 1 Tbsp oil. Add the polenta slices to the pan. Coat the top of the polenta with the remaining 1/2 Tbsp oil. Broil the polenta about 4 inches from the heating element until golden brown and crispy, about 10-15 minutes. 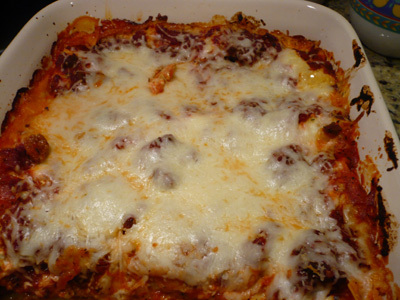 Pour sauce over broiled polenta, then arrange Mozzarella slices over the top and return the casserole to the broiler. Broil until the cheese is melted and beginning to brown, about 2 minutes. Let cool for a few minutes before serving. We are a meatless lasagna kind of household, but I saw a meat lasagna recipe on Paula Deen’s show, and it sounded and looked really good. It was quite tasty and made an enormous amount, so we divided the leftovers and froze them for future yummy dinners. From start to finish it does take nearly 2 hours, so it’s more of a project meal than a quick week night meal. 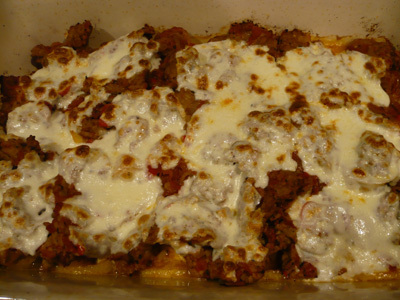 Adapted from Lots O’Meat Lasagna from Paula Deen. In a large saucepan, combine ground turkey, onion, and garlic. Cook over medium heat until meat is browned and crumbled; drain. Return meat to pan and Italian seasoning and salt and pepper, if using. Add tomatoes, tomato sauce, and paste. Bring to a boil, reduce heat and simmer 30 to 45 minutes, uncovered. In a small bowl, combine cottage cheese, Parmesan, and eggs. Bake 45 minutes, uncovered. Top with remaining cheese and bake 15 minutes or until hot and bubbly. Let rest 10 minutes before serving. This pizza is so easy and so tasty. Place pizza stone in oven and set oven temperature to highest setting (should probably do this 1 hour before you want to eat). Meanwhile heat some olive oil in a nonstick skillet and saute peppers, garlic, and onions, until caramelized. 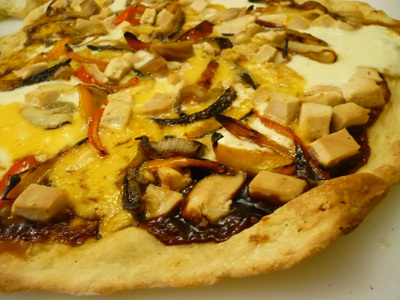 Roll out pizza dough, lightly brush some olive oil, then spread the bbq sauce evenly. Add the peppers, onions, chicken, and cheese. Cook until cheese is bubbly and crust is golden, about 6 minutes.